Druett (She Captains, 2000, etc.) sinks her literary lance deeply into the juicy story of the murder at sea of a vicious whaling captain by mutinous islanders. Her swift, absorbing saga of the sea invokes malice, mayhem, murder, and, hovering over it all, Herman Melville. 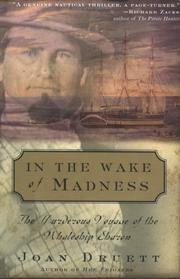 The Sharon, a whaler from Fairhaven, Massachusetts, set sail in the spring of 1841 with a crew of about 30 under the command of Captain Howes Norris, a man likable enough on shore who metamorphosed into a mean-spirited martinet once the Sharon was at sea. Norris reserved his special disfavor for a black steward whom he flogged to death and then dumped unceremoniously into the ocean. (The fellow had endured many previous beatings.) At every port to which the Sharon put in for repairs and/or supplies, men jumped ship. Norris was eventually forced to employ just about anyone who could breathe without instruction and soon had a minimal, insufficient crew. But he still ordered boats lowered when spouts were spotted, even though he stayed on board and drank. During one of these hunts, the captain remained behind with three islanders who had shipped on the Sharon for adventure and profit (they found some of the former, none of the latter). As soon as the whaleboats were away, they slew and mutilated Norris. Third mate Benjamin Clough, who went on to enjoy a spectacular career in whaling, sneaked back aboard in the dark, killed one man, disabled another, and frightened the third into surrender. Druett follows all the principals to their various fates. She offers a primer on whaling as well and intercuts accounts of the doings of other contemporaneous whalers, actual (Melville) and fictional (Ahab). This bloody story was forgotten for more than a century until the author recreated it from scraps she found in newspapers, ships’ logs, mariners’ letters, and journals. A sharp harpoon, a keen eye, an unerring throw.